Each year, the University of Oregon Office of Human Resources hosts years of service recognition events to honor and appreciate the contributions of employees who have worked at the university for five to 45 years. HR hosts two receptions. The first includes all employees reaching milestone work anniversaries in five-year increments through 35 years. The most recent reception took place in the Erb Memorial Union ballroom with more than 500 people in attendance. More than 400 employees reached a major milestone anniversary in 2018, and many of them attended the reception along with their supervisors and co-workers. The reception highlighted and honored the dedication and contributions of those employees by creating a party atmosphere that included games, prizes and a photo booth. A list of honorees is available in the HR website. The second reception recognized the 28 classified and officer of administration employees who have worked at the university for 25, 30 and 35 years. 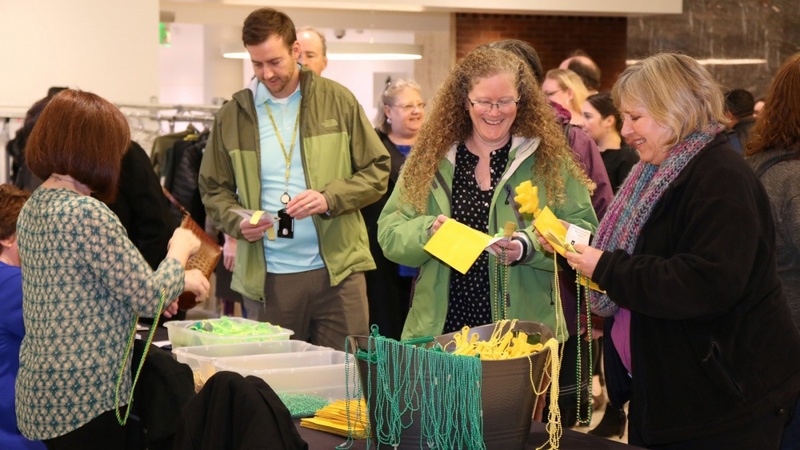 The attendees, who wore yellow flowers to signify their time at the UO, listened as President Michael Schill reflected on the role dedicated employees play in the success of the university. The years of service events are held annually. More information, including photos from the events and a list of prize winners, is available on the HR website.